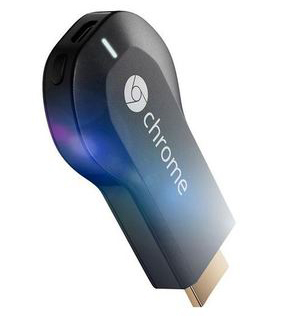 A while ago I wrote about the Chromecast USB bridge that brings web video to your TV. I finally have one and now that I do, I wouldn’t live without it. I use my smart phone to find a YouTube video and cast it to my TV. Then I can turn off my phone and it keeps playing on the TV. And for music this is much better than Pandora. A jazz musician friend was over the other night. He kept telling me about music I should hear. All I had to do was speak the name of the song and musician into the YouTube search field on my phone, then Chromecast it to the TV. The picture and sound quality were both much better than on my phone. That’s because the signal goes from my router directly to the Chromecast device which is plugged into the TV. If your TV has a good audio system. I can think of no better way to hear music in your living room. To control the video, you need to keep your phone turned on. If you turn it off, the video just plays on the TV without any controls like pause. And there’s no random access. But with my phone I can control the video normally. Your need TV needs to have a HDMI input on the TV since that is what the Chromecast dongle plugs into. The Chromecast device runs off your WiFi network like any other devices such as phone, laptop or BluRay player. The device is powered through the USB on your TV. If you don’t have a USB port on your TV, you can use the USB cord and power adapter. It does not support Amazon amazon instant videos. My new BluRay player has a YouTube link, but it is tedious to use. The on screen keyboard is long line of letters A through Z so typing is a slow torture. I gave up on that and got the Chromecast. Chromecast works with Android tablets and smartphones, iPhone® and iPad®, Chrome for Windows, Chrome for Mac® and Chromebooks. Chromecast is outselling Apple TV for the first time.